One of Cherry Creek North’s special townhomes stylishly updated to exude uptown elegance and casual chic. Enter the private courtyard of natural limestone accented by an artistic fountain and professional landscaping to enjoy indoor/outdoor living created by the NANA wall of glass doors opening to the area. The setback entry enhances privacy and visually creates a broad expanse of living space upon entering. Sophisticated finish choices throughout the home provide a quality, lush environment. Drop-dead new kitchen complete with custom honed wood counter and gourmet appliances. Upstairs, sunlight pours through the myriad windows, Master suite has new bath, custom desk area, fireplace and back terrace, as well as second ensuite bedroom and laundry. Fully finished basement with recreation area, guest suite and bath. 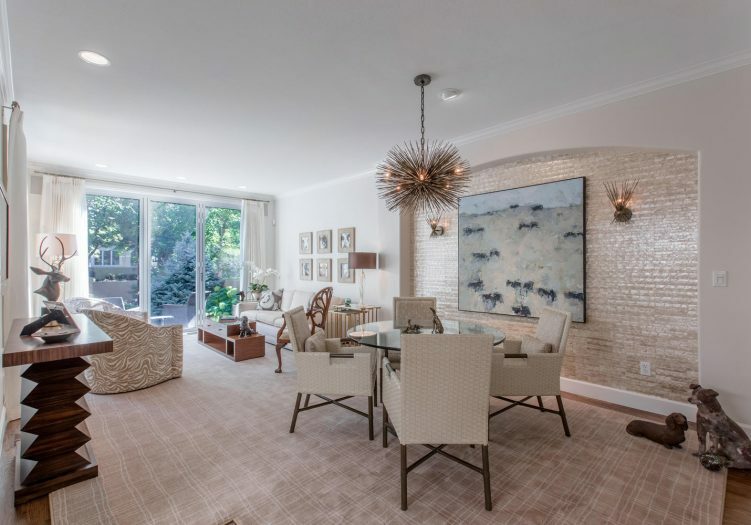 Tastefully appointed furnishings and artwork are available by separate purchase, creating an instant turnkey home for the most discerning Buyers.